This was written when my oldest graduated last year. I wouldn't change a thing. The moment I've been waiting for (dreading). My oldest child is set to leave for college soon, and I'm a bit of a mess. All of the time I thought I would have to spend with her before she leaves is now smooshed into 5 days. My daughter and I have a very open line of communication. We've talked about awkward things. We've talked about silly things. I always answer her questions, and I try not to judge. While she may have been putting off asking very specific or delicate questions, now is the best time to get them out there. I like to drive when we talk about stuff. I drive. She sits and fiddles with her phone. Little eye contact is made, but progress is made by the miles. I answer any questions she has, and we park the car at home, ready to leave it all behind. It's a good system that works for us, and I plan on doing one more of those sessions before she leaves. 2) Encourage her to make rounds. We have 5 brothers all clamoring for her attention before she leaves. We also have aunts, cousins, grandmas, best friends, boy friend (not that kind), and old friends from camp. They seem to be calling at all hours now, wanting to get one more lunch/shopping trip/overnight with my daughter. 3) Do that one thing. We found some kayaks for sale last year for a steal. We bought them before Christmas, and they've been sitting ever since. We were going to take the kids kayaking... and then we didn't. We decided that kayaking was going to be the one thing we did as a family before my daughter left. And we did... just 6 days before she left. College is going to be a big change for my daughter (and us.) The rush of school, work, friends, and family will be replaced with all of that -- and really difficult nursing classes and anatomy labs. I can think of no better way to spend the last few days than with a bit of downtime. Doing nothing, eating popcorn, and watching Guardians of the Galaxy Vol. 2 sounds like just what my daughter (and I) need. Just when we think we have everything checked off the list for college, another thing comes up. A new comforter must be ordered to get here in time for school. We forgot the orange scented disinfecting wipes. Another form must be filled out. Where are those new school books? Cell phone plans should be adjusted. And the list goes on and on. All of it goes better with a little help from mom, and so -- even though I have a ton to do -- I want to be there to help. I'm taking some time off from writing projects to just be present and help when needed. It's what moms do. 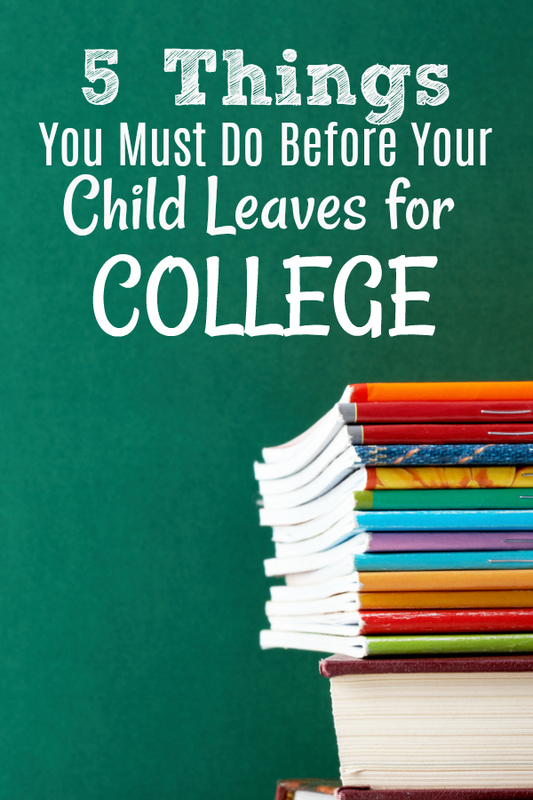 Do you have a son or daughter headed to college? What are the things you are prioritizing before they leave?